My work mission is the construction industry. It’s one of the last unconsolidated industries in America. My goal has been to help the people running these companies so that we can keep this as a family owned industry. I’ve spent a lot of time working on this mission, and I believe in it very strongly. John Murdough specializes in audit, accounting, tax, business and management consulting, business problem solving and transition and strategic planning for the construction industry. John joined Henry+Horne in 2015 as part of the merger with his firm Pittman & Murdough, which he headed up for 25 years. When he’s not working with clients, John is busy writing or teaching. 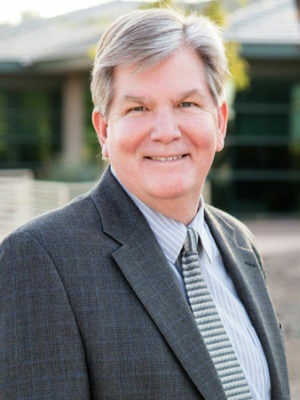 He’s been teaching seminars for more than 25 years including national and local classes for the Arizona Builder’s Alliance and the Sheet Metal and Air Conditioning Contractors’ National Association. He also co-authored the book Managing the Profitable Construction Business and taught at ASU’s graduate construction school for 10 years. Outside of work, you can find John spending time with his son. They like to get outdoors and go to the park. John also draws and paints. His favorite subject to focus on in his art is jazz musicians. I’d probably be a teacher or a professor. That’s what I thought I was going to be when I was striking out in the world. What dream or goal do you still want to accomplish in your life? I would want to write another book or develop some other teaching materials so that I can pass my knowledge on to future generations. Music. I love it so I listen to all kinds of things. What is the problem you’re best at solving for your clients? Someone once told me my special skill in life is handling a combination of people problems and number problems. I like solving puzzles.